November 21, Fineko/abc.az. 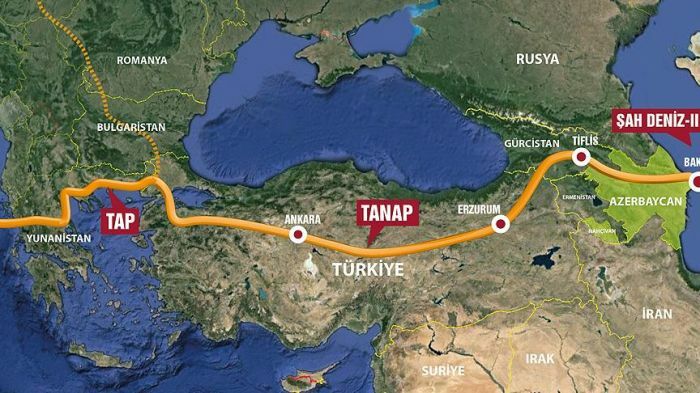 The Trans-Anatolian Gas Pipeline (TANAP), the largest component of the Southern Gas Corridor has been connected to Trans-Adriatic Pipeline (TAP) on the bank of the Merich River on the border between Turkey and Greece. According to the TANAP and TAP consortiums, connection of the two gas pipelines has become an important step on the way of implementation of the Southern Gas Corridor Project. Azerbaijani gas from Shha deniz Project 2 will be pumped via TAP to Europe. Total length of TANAP is 1,850 km. TANAP starts in Turkgozu village, Ardahan province, in the border area between Turkey and Georgia. It crosses 20 Turkish provinces and 67 populated localities to the city of Ipsala in Edirne province, where it is connected to TAP.